Motive Power bleeders are a DIYer's #1 tool because they make multi-person projects, like bleeding brakes, a one person job. No mess, no stress and a perfect system bleed every time. Don't forget to include a pair of brake bleeder bottles with stainless lanyard to hold the excess fluid. Enter promo code MOTIVE10 during checkout for your discount. 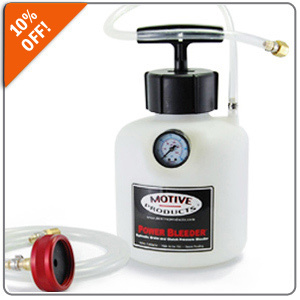 Click HERE for Motive Power Bleeders!